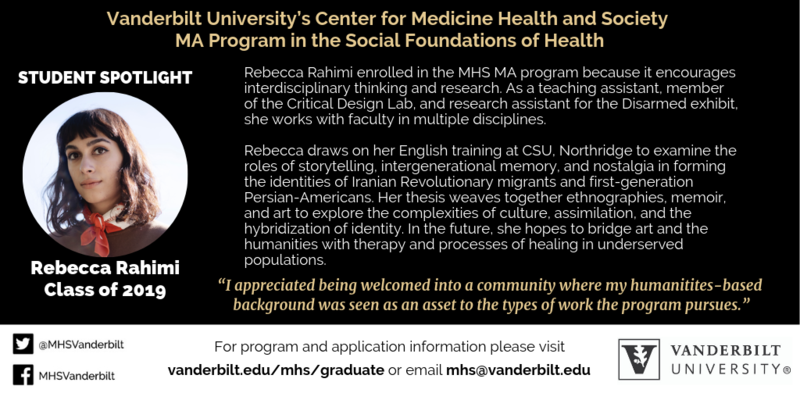 Our broad curriculum allows students the unique opportunity to take classes in the Vanderbilt Graduate School as well as the Schools of Medicine, Nursing, and Law, and the Master of Public Health Program. Through interdisciplinary course work, faculty mentorship, and research collaborations, students learn skills now emphasized on the MCAT and essential to success in health care. Our students go on to medical school, law school, and graduate school, and to successful careers in a wide array of health-related fields. Detailed MHS program and course descriptions are available in the Graduate Catalog. Contact us at mhs@vanderbilt.edu to learn more about our program and the admissions process. The one-year M.A. program in Medicine, Health and Society requires a minimum of 24 credit hours of coursework and a comprehensive exam. Students may choose a thesis/practicum option (24 hours of coursework plus 6 hours of thesis research or independent research) or non-thesis option (30 hours of coursework). Each graduate student works with a faculty mentor to craft an appropriate plan of study. Requirements include the 3-hour core colloquium, MHS 6100 Theories and Methods in Critical Health Studies, an introduction to graduate-level interdisciplinary work in medicine, health, and society, drawing on the perspectives of anthropology, economics, history, political science and policy studies, philosophy, religious studies, and sociology. Additional requirements include MHS 7100 Research Workshop, MHS 7000 Interdisciplinary Research Methods, guided research or internship. A contract of courses must be formally approved by the student’s adviser and the MHS Director. Requirements are the same for both the one-year MA degree and the 4+1 combined BA/MA program. Students in the BA/MA (4+1) program must satisfy all requirements for both the BA degree and the MA degree. There is no double-counting of credits. In order to complete the program in five years, students should be in a position to complete most of the requirements for their undergraduate degree by the end of the first semester of the senior year. It is expected that students who can devote themselves to the MHS program full time will complete their studies in three semesters (i.e., two semesters and one summer or three semesters). However, the length of the program will be flexible to accommodate the needs of different constituencies. Students should meet with their faculty advisor to discuss their course plan. Registration instructions and Registration Related Forms are available through Vanderbilt Graduate School. Graduate students taking an independent study with a faculty member or requesting permission to receive graduate credit for an undergraduate level or professional course should complete and submit these forms by the first day of class. The MA requires a written examination, tailored to the student’s specific course of study, requiring the student to integrate material from the different disciplines. The MHS Director, in consultation with the MHS Curricular Committee, will appoint an examination committee consisting of the student’s adviser and two other faculty members, at least one of whom must be from a field different from the adviser’s. The examination committee will write up the exam, which the student will take during his or her last semester of study (or last summer session) and no later than the week of final exams. The thesis provides students with the opportunity to put the knowledge and research skills they have gained into practice on a topic of interest to them. Students who elect to complete a thesis may enroll in up to 6 hours of thesis research. The thesis should draw on at least two disciplines and follow Vanderbilt Graduate School’s thesis guidelines. For students in the thesis track, the comprehensive examination committee will also constitute the thesis committee and will administer an oral thesis defense. The research-based practicum gives students the opportunity to integrate classroom learning with professional experience. Under the guidance of faculty and site supervisors, students develop practical skills, engage with real-world challenges, and contribute to community resources. Students in the practicum track may enroll in up to 6 hours of independent research that culminates in a written report. Students may choose to do a practicum or thesis project but not both. The non-thesis option allows students to develop a diverse range of skills by taking 30 credit hours of coursework. Students in the non-thesis option will submit for evaluation by the MHS Curriculum Committee one course paper demonstrating their ability to integrate approaches from different disciplines. Requirements include the 3-hour core colloquium (MHS 6100) and an additional four courses drawn from the list of approved courses. Students are required to submit a paper to the MHS curricular committee for evaluation. See graduate certificate guidelines in the graduate catalog. Vanderbilt’s hometown of Nashville is a vibrant, engaging city known proudly as “Music City, U.S.A.” Located a little more than a mile from downtown, the university’s students, faculty, staff and visitors frequently cite Nashville as one of the perks of Vanderbilt. Nashville is home to a diverse health care industry that impacts the health care landscape locally, nationally and internationally.